Only five ingredients in this healthy snack. In a bowl mix together oats, nut butter and honey until thoroughly combined. Scoop 1 Tbsp (15 mL) of mixture into your hands and place a peanut in the centre. 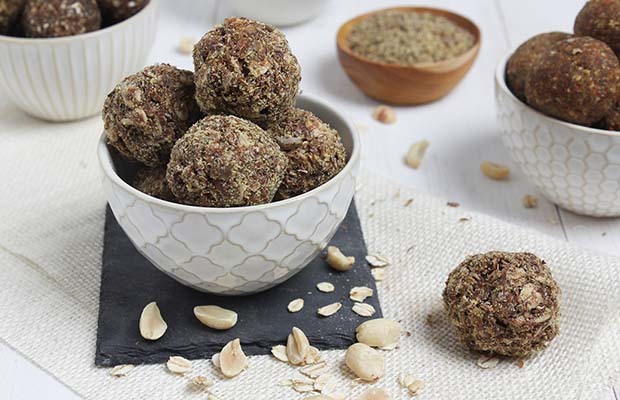 Form into a ball and roll in roasted ground flax. Refrigerate for 30 minutes and serve. Makes 20 energy balls. Serving Size: 2 energy bites. Each serving contains 1 Tbsp (15 mL) ground flax.